Two families that filed a wrongful-death lawsuit against the estate of former New England Patriots star Aaron Hernandez have asked the team to compensate them for the loss of their loved ones. 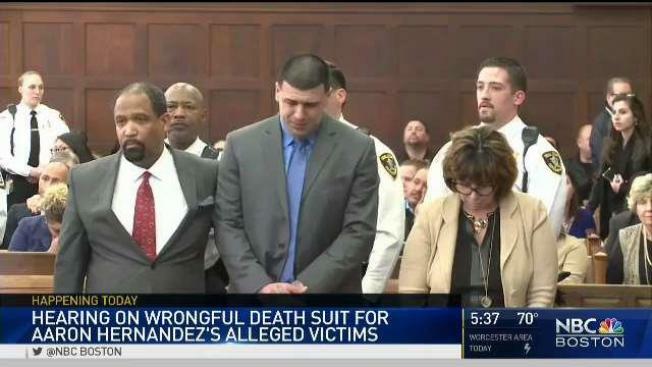 Hernandez was accused in the 2012 fatal shootings of Daniel de Abreu and Safiro Furtado but was acquitted in April. Days later he hanged himself in prison, where he was serving a life sentence in the 2013 killing of Odin Lloyd. Following a status hearing in Suffolk Superior Court on Tuesday lawyers for the families said they would "welcome" the Patriots compensating the families. A team spokesman hasn't responded to a request for comment. An attorney for Lloyd's mother previously called on the team to be "champions of justice" by paying $6 million to Lloyd's estate.